Awesome! I am a lefty and tend to struggle with right-handed tutorials. It took me forever to learn the french knot because I could only find "righty" instructions. Thank you for the how-tos! I am also a lefty, but I always just follow the right handed instructions. I have often wondered if that means my stitches are all wrong. They still look nice, I think...I have no idea if they are "correct" though. I find that trying to follow the left handed instructions just messes me up. Scanning and flipping the instructions is a great idea (and so simple... why didn't I think of that?!). Some stitches are easy to follow and mentally reverse, but others are tricky. I also had issues with the french knot. ;) Thanks for the lefty info! I am not a lefty - but do have a left handed child - so always keen to find ways to help her. I am so right handed I find it very difficult to teach her - so these resources will be great - Thank you. 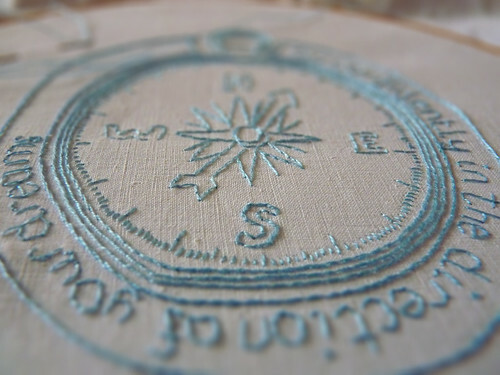 Also love the compass pattern - any hints where it is from?